[SatNews] Earlier today, navigators and mission controllers for NASA's EPOXI mission watched their computer screens as 23.6 million kilometers (14.7 million miles) away, their spacecraft successfully performed its 20th trajectory correction maneuver. The maneuver refined the spacecraft's orbit, setting the stage for its flyby of comet Hartley 2 on Nov. 4. Time of closest approach to the comet was expected to be about 10: 02 a.m. EDT (7:02 a.m. PDT). Today's trajectory correction maneuver began at 2:00 p.m. EDT (11 a.m. PDT), when the spacecraft fired its engines for 60 seconds, changing the spacecraft's velocity by 1.53 meters per second (3.4 mph). "We are about 23 million miles and 36 days away from our comet," said EPOXI project manager Tim Larson of NASA's Jet Propulsion Laboratory in Pasadena, Calif. "I can't wait to see what Hartley 2 looks like." On Nov. 4, the spacecraft will fly past the comet at a distance of about 700 kilometers (435 miles). It will be only the fifth time in history that a spacecraft has been close enough to image a comet's nucleus, and the first time in history that two comets have been imaged with the same instruments and same spatial resolution. "We are imaging the comet every day, and Hartley 2 is proving to be a worthy target for exploration," said Mike A'Hearn, EPOXI principal investigator from the University of Maryland, College Park. EPOXI is an extended mission that uses the already "in flight" Deep Impact spacecraft to explore distinct celestial targets of opportunity. 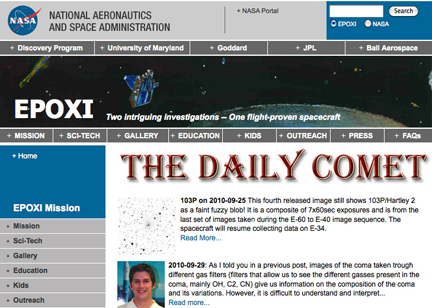 The name EPOXI itself is a combination of the names for the two extended mission components: the extrasolar planet observations, called Extrasolar Planet Observations and Characterization (EPOCh), and the flyby of comet Hartley 2, called the Deep Impact Extended Investigation (DIXI). The spacecraft will continue to be referred to as "Deep Impact." NASA's Jet Propulsion Laboratory, Pasadena, Calif., manages the EPOXI mission for NASA's Science Mission Directorate, Washington. The University of Maryland, College Park, is home to the mission's principal investigator, Michael A'Hearn. Drake Deming of NASA's Goddard Space Flight Center, Greenbelt, Md., is the science lead for the mission's extrasolar planet observations. The spacecraft was built for NASA by Ball Aerospace & Technologies Corp., Boulder, Colo.